Have you ever try to use Counterpain Balm or cream? 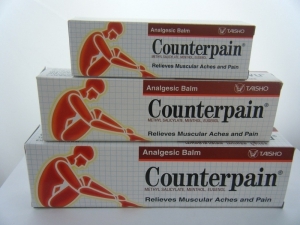 I always have Counterpain balm in the house. Just in case that something happen with my muscle for example, I can immediately apply Counterpain Balm on top of the area where I have the pain from the muscle. sore, stiff, strained and another painful muscles. like the red one. But the results of those Counterpain product will be the same. I like to use the Blue one now. Because I will not feel the hot thing in my skin when I apply Counterpain Blam creme to reduce the painful muscles in my body. balm will stay on top of my skin, in the place where I have painful muscles for longer time. But if I wash that area, of course the balm will be gone as well then you need to apply it again if you still have the pain in your muscles. Counterpain can be found in drug store or pharmacy store near my place. But I am not sure if in the other country, you can get this Counterpain product easily. You’re lucky if you can find it easily in your country. It means that you can buy it easily whenever you have painful muscles and apply it in the area where the painful is. I purchased a tube of counterpain when I was in Greece this summer. It beats ben gay over 100 times. I meant to purchase more tubes before we left but there seemed to be no time left. We live in Marine City, Mi. Can you tell me if I can purchase it here or ask my sister-in-law to buy and send to me?? Best product I have ever used and I thank the Pharmacist who sold it to me.